Translation is the necessity for today’s world and we are providing the Hindi translation in its best possible way. We employ only the very best Hindi translators the world has to offer. They are meticulously screened during our rigorous selection process so that only specialists having the best qualification, industry experience and subject expertise handle your translations. We only work with dependable and experienced translators who consistently display superior performance and quality results. We ensure that the Hindi translators assigned to your project have the appropriate expertise required to provide you with a high quality, culturally sensitive translation in any field that you desire. Hindi Translation Fields: Document Translation ( IT Manual, Software Manual, Multilingual User Manual, Technical Script and Manual, Training Material, Medical Documents, Engineering Documents, Marketing & Advertising, Legal Documents, Literatures, Official Papers, Tourism, Sports), Website Translation, Software Localization, Multilingual Web Publications, Web Content management and translation, Print Publications. 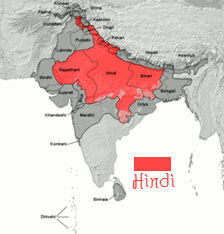 Hindi is the name given to an Indo-Aryan language, or a dialect continuum of languages, spoken in northern and central India (the "Hindi belt"). Native speakers of Hindi dialects between them account for 41% of the Indian population (2001 Indian census). As defined in the Constitution, Hindi is one of the two official languages of communication (English, the other) for India's federal government and is one of the 22 scheduled languages specified in the Eighth Schedule to the Constitution. Official Hindi is often described as Modern Standard Hindi, which along with English, is used for administration of the central government. The word hindī is of pre-Islamic Persian origin. It literally means "Indian", comprising hind "India", and the adjectival suffix -ī. The word was originally used by pre-Islamic Persian merchants and ambassadors in north India to refer to any Indian language. Defined regionally, Hindi languages, i.e. the dialects native to Northern India in a narrower sense, the Central zone dialects, divided into Western Hindi and Eastern Hindi in a wider sense, all languages native to north-central India, stretching from Rajasthani in the west and Pahari in the northwest to Bihari in the east. Like many other modern Indian languages, it is believed that Hindi had been evolved from Sanskrit, by way of the Middle Indo-Aryan Prakrit languages and Apabhramsha of the Middle Ages. Though there is no consensus for a specific time, Hindi originated as local dialects such as Braj, Awadhi and finally Khari Boli after the turn of tenth century. Hindi to English Translation services - Low Cost Hindi Translation- Indian Language Translators - Cost effective Hindi Translation Network - Kolkata Hindi Translation - Website Localization India - Kolkata Translators - Hindi Content Writing India - Hindi Language Professionals Kolkata.